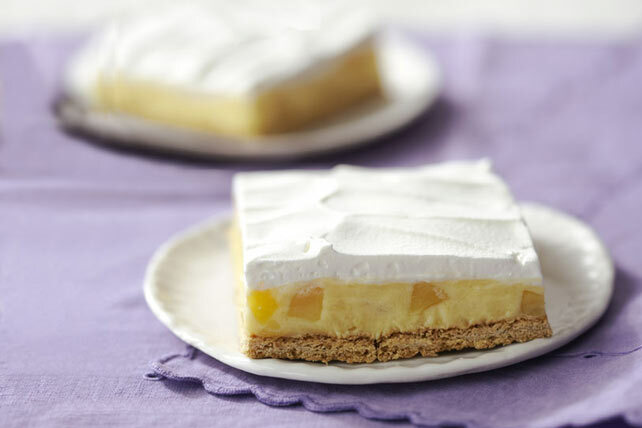 Layers of graham wafers and creamy pineapple filling are topped with a dreamy whipped topping in this no-bake make-ahead dessert recipe. Just follow the 3 simple steps in this Cool & Creamy Pineapple Squares recipe and you'll be on your way to dessert heaven. Cover bottom of 13x9-inch pan with graham wafers. Add milk to dry pudding mix in large bowl. Beat with wire whisk 2 min. or until well blended. Stir in pineapple and yogurt; spoon over wafers. Top evenly with whipped topping; cover. Refrigerate at least 3 hours or overnight. Store any leftover dessert in refrigerator. Prepare as directed. Sprinkle with 1/4 cup toasted shredded coconut just before serving. Substitute 1 can (398 mL/14 fl oz) pineapple tidbits in juice, well drained, for the chopped fresh pineapple. Help your friends and family eat right with this delicious dessert that is made with better-for-you products!